Fairly large thymus in an infant. Gross appearance of a thymoma showing distinct multinodularity and scattered, focal cystic changes. Thymolymphoma. 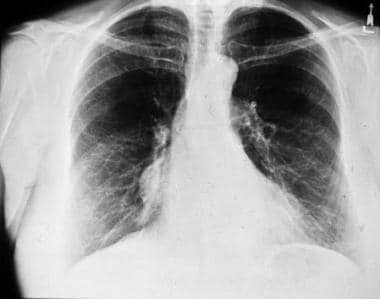 Chest radiograph shows a large, lobulated mediastinal mass. Malignant thymoma. Chest CT scan in a 61-year-old man with myasthenia gravis demonstrates a large, lobulated mass with punctate calcification in the anterior mediastinum; these findings are consistent with a thymoma. Low-lying thymoma. Plain chest radiograph shows a mass lying against the right heart border. In most cases, thymolipomas are detected incidentally on chest radiographs. They are often large, ranging up to 36 cm in diameter (mean, 18 cm) at the time of diagnosis. Thymolipomas may project into the hemithoraces; they may be seen draping over the heart and extending as far as the costophrenic angles. They can be easily mistaken for pleural or pericardial tumors or even pulmonary sequestration. From birth to puberty, CT scan attenuation of the thymus is comparable to that of the chest wall musculature. The outer contours of the thymus may be convex laterally. The lobes, though separate, may have a triangular shape and may be slightly rotated to the left. The junction between the lobes is about 2 cm to the left of the midline. From puberty to 30 years age, the overall attenuation value diminishes secondary to fatty infiltration; during this period, attenuation is less than that of skeletal muscle. The thymus is often seen as a discrete triangular or bilobed structure, with the outer borders appearing straight or slightly concave laterally. Changes in the thymus over time are demonstrated in the image below. Normal thymus. The thymus is located anterior to the aortic arch, and sometimes 2 lobes can be seen. The thymus is prominent in newborns, occupying most of the anterior mediastinum. After puberty, fat progressively infiltrates the thymic tissue. At age 40 years, the thymus is nearly completely replaced with fat, and only slight residual nodular density of thymic tissue remains. 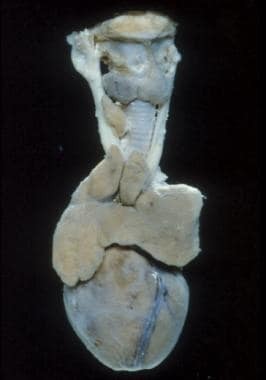 A, Normally prominent thymus at age 7 months. B, Thymus in a 9-year-boy. C, Increasing fatty infiltration of the thymus noted in a 20-year-old man. D, The thymus has involuted and is atrophic in a 38-year-old man. Only a few nodular attenuations are visible. After the age of 30 years, remnants of thymic tissue appear as small islands of soft tissue attenuation; these islands appear as linear, oval, or small and round configurations on a background of more abundant fat. In the older patient, only a thin fibrous skeleton of the thymus remains. At this point, the thymus is almost totally composed of fat. The most reliable and meaningful measurements of the thymus are related to its thickness. Before the age of 20 years, 1.8 cm is the normal thickness; thereafter, the normal thymus does not exceed 1 cm in thickness. About two thirds of patients with myasthenia gravis have thymic hyperplasia; 25-50% of these patients are likely to have a normal thymus on CT scanning. Histologic analysis of the thymic medulla reveals numerous lymphoid follicles with active germinal centers. Thymic cystic teratoma. 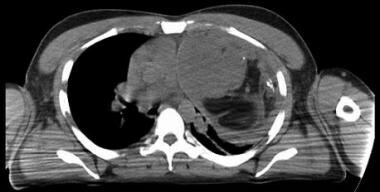 This thin-walled cystic mass contains a fat-fluid level. On CT scans, seminomas are usually large and homogeneous, with soft tissue attenuation. Areas of low attenuation often are present secondary to necrosis and hemorrhage. Nonseminomatous tumors include embryonal carcinoma, endodermal sinus tumor, choriocarcinoma, and mixed germ cell tumor. On CT scans, these lesions are often large and heterogeneous, with large (>50%) areas of low attenuation. They may contain areas of calcification. Thymolymphoma. Contrast-enhanced CT scan demonstrates a large, lobulated, soft tissue mass in the anterior mediastinum that posteriorly displaces the aorta and pulmonary artery. Thymic carcinoma belongs to a group of uncommon epithelial neoplasms. They are characterized by cytologic atypia and anaplasia. 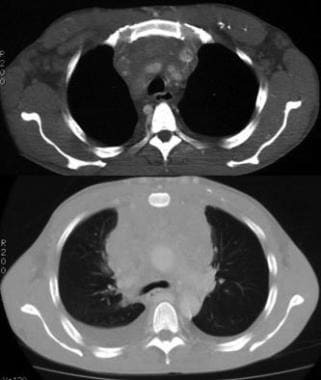 On CT scans, they often show central necrosis in a large tumoral mass, with invasion and infiltration of adjacent structures in the mediastinum. Because of their aggressive nature, they are likely to produce hematogenous and lymphatic spread, locally and distally. Thymolipoma. 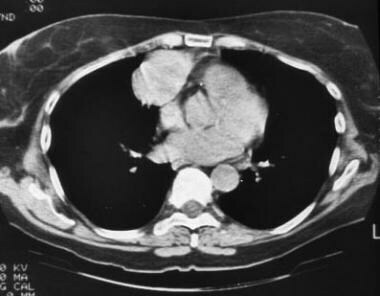 CT scan of the chest shows a large anterior mediastinal mass displacing the mediastinal vascular structures to the right and projecting into the left thorax. 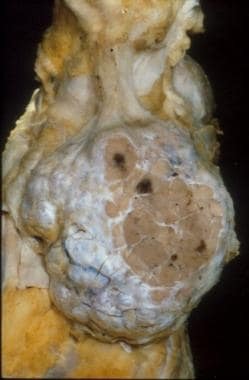 The tumor is composed of soft tissue and fat, and a few punctate calcifications are present. On CT scans, a thymic cyst appears homogeneous with water attenuation. The attenuation may vary, depending on the contents of the cyst. High attenuation may be present if the cyst contains proteinaceous fluid or blood from hemorrhage. A neoplasm with cystic degeneration may closely mimic a thymic cyst; associated soft tissue attenuation may help in their differentiation. After initiation of chemotherapy, CT scans may reveal a decrease in the size of the thymus. Rebound in the form of overgrowth occurs a few months after completion of chemotherapy. Criteria for rebound include an increase in size of greater than 50%, as compared with the baseline volume. Chest CT scanning performed with and without contrast enhancement is clearly superior to routine radiography. 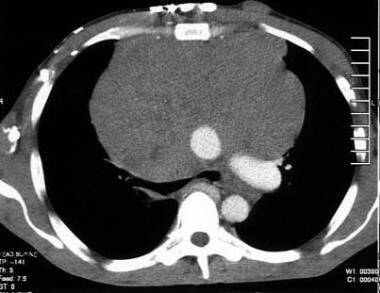 A small thymic tumor can easily be missed on a chest radiograph, whereas CT scans distinctly delineate the tumor. In addition, enhancement often helps in clearly differentiating the mass from the surrounding vascular structures. This is helpful in planning surgery. On imaging studies, bilateral extension of the mass, absence of fat planes, and invasion of adjacent structures are indications of malignancy. MRI may show similar findings. The demonstration of encapsulation of the mass and the homogeneous enhancement of the capsule are indications of benign tumors; these structures are better imaged with CT scanning. MRI and CT scanning often complement each other and can facilitate preoperative diagnosis and staging of the thymus neoplasms. In cases of lymphoid follicular hyperplasia, the thymus may not always appear enlarged; this may be overlooked on CT scans. Thymoma. CT scan shows a homogeneous thymic mass. Invasive thymoma. 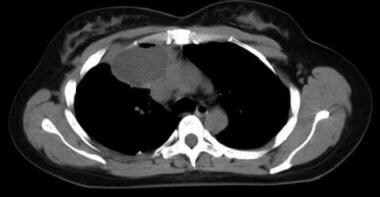 Contrast-enhanced CT scan shows a thymic mass with variable attenuations invading the adjacent mediastinum. 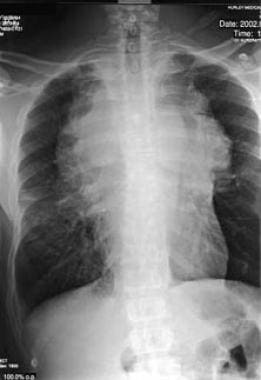 Bilateral pleural effusions are also present, indicating pleural invasion. When cystic degeneration, necrosis, and old hemorrhage are present, the affected areas are of low attenuation. Normal thymus that has undergone fatty infiltration and a pulmonary mass adjacent to the anterior mediastinum sometimes mimic a thymoma. 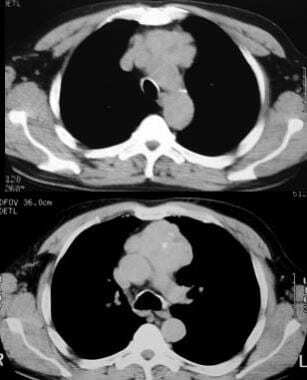 In cases of encapsulated thymoma, CT scanning often reveals a preserved fat plane completely surrounding the mass. Fibrous adhesions and inflammation may mimic invasion of the tumor. 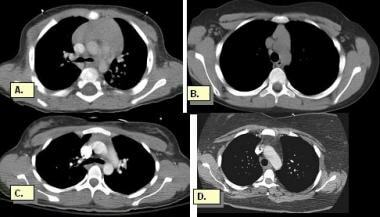 On CT scans, invasive thymoma is often characterized by encasement of mediastinal structures and pericardial/pleural implants; in advanced cases, transdiaphragmatic spread is seen. In some cases, MRI is superior to CT scanning for visualizing the thymus and for differentiating it from the surrounding soft tissue. In healthy children younger than 5 years, MRI shows the thymus to have a quadrilateral shape and biconvex lateral contours. In older children and adolescents, the thymus is triangular with straight, lateral margins. On T1-weighted images, the thymus appears homogeneous with a signal intensity slightly greater than that of muscle; on T2-weighted images, the signal intensity is close to that of fat. Mass lesions in the mediastinum have sufficiently different imaging characteristics to allow their distinction on MRI from normal structures and fat, and MRI produces excellent cross-sectional images in the mediastinum without contrast enhancement; with CT, contrast material is often needed to properly identify a mass and to avoid mistaking blood vessels for a mass lesion. Encasement or invasion of the vasculature, esophagus, and trachea and involvement of the pericardium, myocardium, and pleura are accurately detected with MRI. In all adults, the thymus is visible on MRI. Distinction between higher intensity mediastinal fat and the relatively hypointense thymus is optimal on T1-weighted images because of the long T1 of the thymus. The progressive decrease in T1 with advancing age is commensurate with the fatty infiltration associated with advancing age. However, the T2 relaxation times of the thymus do not change with aging. The thymus usually appears thicker on MRI than on CT in patients older than 20 years. On T1-weighted images, thymomas have medium signal intensity that is higher than that of skeletal muscle but that is lower than that of fat. On T2-weighted images, the signal intensity approaches or exceeds that of fat. The mass often appears mostly homogeneous; areas of cystic degeneration appear as areas of variable signal intensity on T1-weighted images. This appearance is the result of variations in protein content or of hemorrhage; however, on T2-weighted images, thymomas appear bright. The hypointense fibrous septa often gives the mass a lobulated appearance. Thymic hyperplasia and normal thymus share the same characteristics on MRI. In the case of thymolipoma, T1-weighted MRIs reveal high signal intensity, which represents fat; strands of intermediate intensity represent thymic tissue. T1-weighted MRIs of thymic cysts reveal low signal intensity; T2-weighted images show high signal intensity consistent with the fluid component of the lesion. T1-weighted images naturally show high signal intensity if the cyst contains blood from hemorrhage or if it is rich in proteinaceous fluid. Qualitative evaluation of gross thymic morphology (ie, size, shape, margins, and signal intensity) is usually sufficient for distinguishing normal thymus from abnormal thymus. The abnormal thymus generally is enlarged, multilobular, or inhomogeneous because of the presence of cystic degeneration, hemorrhage, septations, fibrosis, or calcification, as seen on pathologic sections. In patients with lymphoma, associated lymphadenopathy is helpful in distinguishing normal thymus from abnormal thymus. On T1-weighted spin-echo images, thymic lipomas have areas of high signal intensity, because of their fat content; the signal intensity is similar to that of subcutaneous fat, with areas of intermediate signal intensity reflecting the presence of soft tissue. Although thymic lipomas can attain a large size, they invariably do not invade surrounding structures. However, they can cause mass effect on the surrounding structures because of their size. MRI findings in thymic carcinoid tumors are nonspecific and are identical to those of thymoma. On T1-weighted images, thymic carcinoma has higher signal intensity than muscle; on T2-weighted images, there is an increase in signal. Heterogeneous signals often reflect the presence of necrosis, cystic degeneration, or hemorrhage. Teratomas have various appearances on MRI, depending on the composition of the tumor. They commonly contain fat, which is of high signal intensity on T1-weighted images. Cystic changes may also be present; such changes have low signal intensity on T1-weighted images, but they have increased signal intensity on T2-weighting. MRI often shows the inhomogeneous nature of seminomas. With MRI of the thorax, motion artifacts may occur. Breathing motion and pulsation of the heart and great vessels can markedly degrade image quality. Hence, in general, fast imaging sequences and artifact reduction techniques must be used for MRI of the mediastinum and chest. MRI provides information similar to that provided by CT scanning in the evaluation of thymomas. MRI is particularly useful when an intravenous contrast agent cannot be administered for use with CT because the patient is allergic to the agent. On early images,201 Tl accumulation is more intense in thymomas than in the normal thymus and in lymphoid follicular hyperplasia. On delayed images, uptake is more intense in thymoma and in lymphoid follicular hyperplasia than in the normal thymus. Therefore,201 Tl SPECT scanning can be used to differentiate normal thymus from lymphoid follicular hyperplasia and thymoma in patients with myasthenia gravis. 201 Tl uptake is considered to reflect various factors, including cellular metabolic activity, regional blood flow, and the number of viable cells in the lesion; hence,201 Tl imaging is in some respects superior to CT scanning. Ustaalioglu BB, Seker M, Bilici A, et al. The role of PET-CT in the differential diagnosis of thymic mass after treatment of patients with lymphoma. Med Oncol. 2010 Feb 13. [Medline]. El-Bawab HY, Abouzied MM, Rafay MA, Hajjar WM, Saleh WM, Alkattan KM. Clinical use of combined positron emission tomography and computed tomography in thymoma recurrence. Interact Cardiovasc Thorac Surg. 2010 Oct. 11(4):395-9. [Medline]. [Full Text]. Fujishita T, Kishida M, Taki H, Shinoda C, Miyabayashi K, Fujishita M, et al. Detection of primary and metastatic lesions by [18F]fluoro-2-deoxy-D-glucose PET in a patient with thymic carcinoid. Respirology. 2007 Nov. 12(6):928-30. [Medline]. Koopmans KP, de Groot JW, Plukker JT, de Vries EG, Kema IP, Sluiter WJ, et al. 18F-dihydroxyphenylalanine PET in patients with biochemical evidence of medullary thyroid cancer: relation to tumor differentiation. J Nucl Med. 2008 Apr. 49(4):524-31. [Medline]. Treglia G, Lococo F, Petrone G, Stefanelli A, Carnassale G, Calcagni ML, et al. A rare case of primary thymic Hodgkin lymphoma in an elderly patient detected by 18F-FDG PET/CT. Clin Nucl Med. 2013 May. 38(5):e236-8. [Medline]. Jackson T, Viner M, Subramaniam R. FDG PET/CT of carcinoma showing thymus-like differentiation. Clin Nucl Med. 2012 Jul. 37(7):718-9. [Medline]. Goldstein AJ, Oliva I, Honarpisheh H, Rubinowitz A. A tour of the thymus: a review of thymic lesions with radiologic and pathologic correlation. Can Assoc Radiol J. 2015 Feb. 66 (1):5-15. [Medline]. Kim KH, Seo HS, Lee YH, Lee KY, Kim YS, Son GS, et al. Study of intrathyroid fat-containing lesions using CT imaging with literature review. Neuroradiology. 2013 Nov. 55 (11):1405-11. [Medline]. Siegel MJ, Glazer HS, Wiener JI, Molina PL. Normal and abnormal thymus in childhood: MR imaging. Radiology. 1989 Aug. 172(2):367-71. [Medline]. Kumar A, Regmi SK, Dutta R, et al. Characterization of thymic masses using (18)F-FDG PET-CT. Ann Nucl Med. 2009 Aug. 23(6):569-77. [Medline]. Eguchi T, Yoshida K, Hamanaka K, Shiina T, Koizumi T, Kawakami S, et al. Utility of 18F-fluorodeoxyglucose positron emission tomography for distinguishing between the histological types of early stage thymic epithelial tumours. Eur J Cardiothorac Surg. 2012 May. 41(5):1059-62. [Medline]. Higuchi T, Taki J, Kinuya S, et al. Thymic lesions in patients with myasthenia gravis: characterization with thallium 201 scintigraphy. Radiology. 2001 Oct. 221(1):201-6. [Medline]. Marked regression of the mass shown in the previous image after treatment.